Thanks to NetGalley and Berkley for granting my request to read Good Luck With That. I’ve dealt with weight issues most of my life. More like body image issues when I come to think of it. Having grown up in the sixties and seventies I wished I could look like the girls on tv sitcoms (Brady Bunch, Partridge Family, etc). Those girls were slim and had long straight center-parted hair and I was average shape with dark naturally curly hair that had a mind of its own. I remember the day the female freshman PE teacher weighed us and measured our height. I was 5’6 and weighed 120 lbs. I felt huge – so much taller and bigger than my classmates. Talk about poor self-image, huh? So that’s what I brought with me when I read Good Luck With That. Kristan Higgins is on my trusted favorite authors list – meaning I’ll read whatever she writes. But this one was a tough read for me. It hit so close to home on a few levels. Not exactly though – because my mother wasn’t as purposely (cluelessly?) hurtful as Georgia’s. No, my mom was well-meaning and thought she offered positive encouragement. Sigh. So this novel is about three friends who met at a camp for overweight teenage girls. They formed a bond that carried over into adulthood. As often happens after college they met less often and kind of lost track of one friend, Emerson, because she lived hours away. Sadly, their last time to meet is when she’s dying. After Emerson’s funeral Marley and Georgia open an envelope containing the list they compiled at camp when they were seventeen. It’s a list of things they’ll do when they are skinny. Emerson has requested they do the things on the list and that leads them to examining their relationship with food, men, family, etc. Good Luck With That is written in Higgins’ usual warm, emotional style. Her characters’ families drew laughs and winces from me. I loved seeing Georgia and Marley take more control of their issues and discover how empowering that control can be. Filled with (mostly) delightful and endearing secondary characters I have to say this novel grew on me. What started as a book I had to put down a few times in the beginning due to certain scenes and topics, I finished the second half in a few hours. I’m glad I had the chance to read it. I think it would be a good selection for book groups – there’s a reader’s guide at the end. Description: Letting go of her ex-husband is harder than wedding-dress designer Jenny Tate expected…especially since his new wife wants to be Jenny’s new best friend. Sensing this isn’t exactly helping her achieve closure, Jenny trades the Manhattan skyline for her hometown up the Hudson, where she’ll start her own business and bask in her sister Rachel’s picture-perfect family life…and maybe even find a little romance of her own with Leo, her downstairs neighbor, a guy who’s utterly irresistible and annoyingly distant at the same time. Rachel’s idyllic marriage, however, is imploding after she discovers her husband sexting with a colleague. She always thought she’d walk away in this situation, but her triplet daughters have her reconsidering her stance on adultery, much to Jenny’s surprise. Rachel points to their parents’ perfect marriage as a shining example of patience and forgiveness; but to protect her sister, Jenny may have to tarnish that memory—and their relationship­—and reveal a family secret she’s been keeping since childhood. 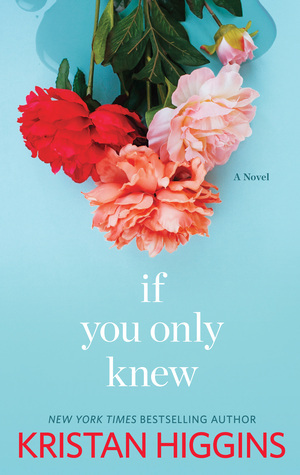 My take: Kristan Higgins’ novel about sisters who face challenges and choices will be on my 2015 Favorites list. I loved how real the challenges were that faced Jenny and Rachel and how they met those challenges. Jenny, the strong and outgoing sister, is starting over in her hometown after her husband told her he didn’t want to be married to her anymore. She’s an optimist though and is determined to move forward. Rachel, the introvert who takes pride in her orderly house and life, thought she could keep her family safe and happy by spending every moment trying to keep them insulated from anything bad. I was pulling for them both and was so pleased with how Higgins brought them both through at the end. The support characters are pretty wonderful too. A few are as well-developed as the primary characters and had a hold on my heart through the entire novel – I’m looking at you Leo and Evander and… well, you get the idea. Even though I wanted to throttle Leo a couple of times everything became clear in the end. If You Only Knew is a book I’d recommend to book clubs whose members (adults) are of varied ages. I think that would bring a lot to the discussion because of the different perspectives. If you’re like me and aren’t a book club member I’d recommend it to fans of Kristan Higgins and women’s fiction. Note: I read most of this book while on the treadmill but I knew when I had about 100 pages left I would need to find a quiet room (and a box of tissues). So that’s my heads-up. Synopsis (Publisher): After her father loses the family fortune in an insider-trading scheme, single mom Parker Welles is faced with some hard decisions. First order of business: go to Gideon’s Cove, Maine to sell the only thing she now owns—a decrepit house in need of some serious flipping. When her father’s wingman, James Cahill, asks to go with her, she’s not thrilled…even if he is fairly gorgeous and knows his way around a toolbox. 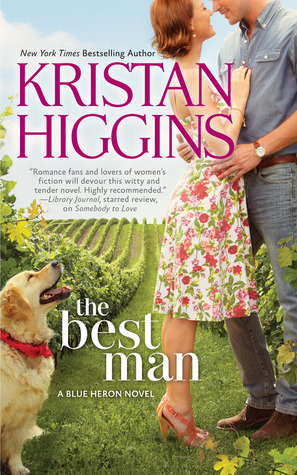 My take: Kristan Higgins did it again. She managed to make me laugh out loud one minute and the next minute was pulling the old heartstrings. I loved the story of Parker and James and how they learned that sometimes you have to ask for a second chance and sometimes you have to give one. A sweet story that has me checking my shelves for another Kristan Higgins novel. Reading Somebody to Love made my treadmill time a breeze! About: (Pub. synopsis) Posey Osterhagen can’t complain. She owns a successful architectural salvaging company, she’s surrounded by her lovable, if off-center, family and she has a boyfriend—sort of. Still, something’s missing. Something tall, brooding and criminally good-looking…something like Liam Murphy. When Posey was sixteen, the bad boy of Bellsford, New Hampshire, broke her heart. But now he’s back, sending Posey’s traitorous schoolgirl heart into overdrive once again. She should be giving him a wide berth, but it seems fate has other ideas…. My take: Sounds like another fun Kristan Higgins novel, doesn’t it? Well, it is that and more. 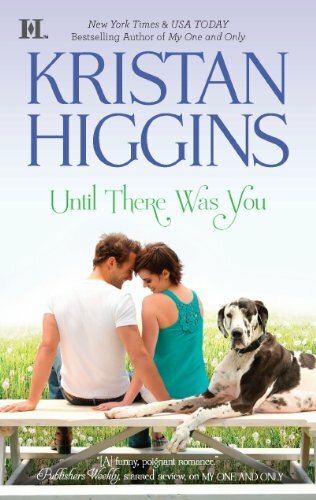 Higgins’ trademark humor and sympathetic heroine-with-a-wacky-family are definitely there but, in my opinion, the true star of Until There Was You is Liam Declan Murphy.He is not your run-of-the-mill former bad boy. Liam Murphy is a complex man. He is also a widower with a teenage daughter. He’s just trying to be a good father and make a home for his daughter. I loved that Higgins revealed his layers throughout the entire novel and not in one pat description. Posey is an ordinary young woman who wants to find what seems so easy for her brother and cousin – someone to love. She is such a relatable character that it was easy to cheer her on. What she finds is that her impression of people and events (present and past) may or may not have been accurate. That knowledge makes all the difference to Posey and her life going forward. Until There Was You is charming and heartwarming. I really enjoyed it. Recommended to fans of Chick Lit, Contemporary Romance, and Kristan Higgins.